Large paintings and mirrors cannot be framed as you would normally frame a smaller work of art. The frame needs to be engineered. Large frames are hard to make. 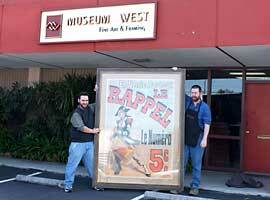 Museum West has many expert framers and framer assistants. We know how to make a big frame. This is why other frame shops come to us to help them with the jobs they can't handle themselves. Many of our customers for large frames have been referred to us by museum curators and other collectors. We have an excellent selection of mouldings that can be used for large frames and our designers understand that some materials are better than others for use in a large frame. It is hard, physical work and we know what we are doing. We also know how to deliver and install the work once we make it. Copyright ©2016 Museum West, All rights reserved.